The Case Model S series was produced from 1940 to 1955, as a replacement for the Model R and RC. It was generally an agriculture tractor with a double plough, and a four-speed gearbox. 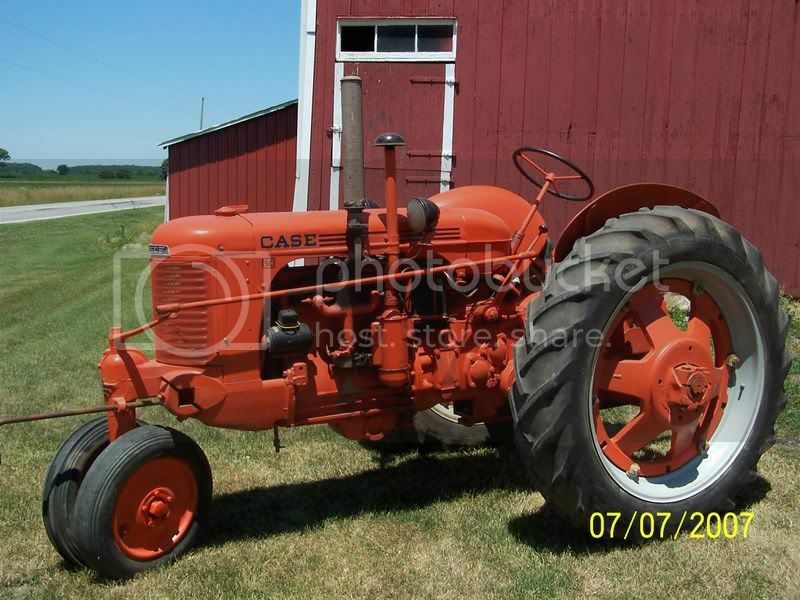 The Case Model S series was also the first Case tractor series to be painted in what is now known as Case Flambeau Red. The “main” Model S was the fixed, wide-front, standard tread version. The Model SC was a general purpose tractor, also known as a row-crop tractor, and had a “tricycle” wheel set-up. There were two less-popular versions of the Model S series, as well. The SO was created for orchard use, and the SI was the industrial version. The Model S had a four-cylinder, gasoline engine with a 2.5L/153.9ci displacement. The tractor had 16 horsepower at the Drawbar, and 21 horsepower at the Belt. It was a two-wheel drive, with manual steering and disc brakes. The SC started out with a distillate-run engine, but switched to a gasoline engine in 1953. They were both four-cylinder engines, but nearly every number increased with the introduction of the larger, gas engine. In April of 1941, the distillate engine tested with a Belt horsepower of 22.3, and a Drawbar horsepower of 19.4. Once the larger engine was used, the numbers jumped to 31.7hp and 27.7hp. I am looking for the service manual for a 1956 Power King Tractor It was manufactured by Engineering Products of Waukesha, WI. They also made tractors under the name Economy and Jim Dandy. s/n 4583, B&S Model 23FB, Type 203515, Engine s/n 209-962. Any help in locating manuals would be appreciated. Would anyone have, or know where I could locate a set of rear fenders for a Case S? I have 1959 case 60 series for sale i was wondering what i could get for this tractor or call me. 1-403-350-0127. Does anyone know what size of bucket with arms you can put onto a 1953 Case gas motor? I am starting to rebuild my grandpa’s tractor and he said it use to have a bucket on there and I am trying to get it back to what the original of the tractor was when he had it running. Any information about the tractor would be really helpful thank you. I have a 1951 Model S Case and am looking for 2 rear tire rims 12.4 x 26, would like to restore Dad’s old tractor. It still runs pretty good. You can call 306-382-5285 Saskatoon Sask. “Canada” or Email and I’ll call you. I HAVE A 100% RESTORED CASE S TRACTOR FOR SALE IF ANYONE IS LOOKING FOR ONE TO COMPLETE YOUR SET . PLEASE EMAIL QUESTIONS . Hello , bought a 1949 so case tractor for 1500, new tires all the way around, real nice paint job, runs great. I have an ‘S’ series Case tractor in excellent condition but the exhaust manifold is burnt out. I have searched with Case/IH and various Web sites without luck and wonder if there are any Case- ifiles out there who can suggest where I might go to find a replacement. I am looking for a exhaust manifold for ‘S’ Series Case. No luck sourcing anywhere in Australia. Grateful if anyone has a suggestion on where I might find this.